The Pool Circulator . . . now even better than ever!!! Scroll down to browse through information about The Pool Circulator and how it dramatically improves pool water circulation, chemical dispersion and heat distribution. 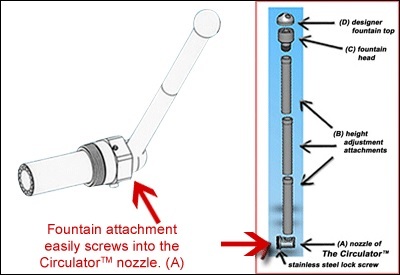 Simply replace the existing return fitting with The Circulator. The Website Store Directory contains an alphabetized listing of all products for sale. We don't just sell products. We help you make a better-informed choice, by providing all the information, you might require. Need ordering help? Scroll down the page, for the Order Desk Telephone Help Number. All items ordered will end up in the same shopping cart, no matter which page of this website, the items are located. All Major Credit Cards and PayPal are accepted. Order one today. ORDER NOW AND GET A FREE SOLAR LIGHT. $39.95 VALUE!!! Click monitor to view a Demonstration video. The Pool Circulator is the most effective, inexpensive and economical way to easily improve pool water circulation. The Circulator helps eliminate the dead zones, that promote algae growth and reduces water improves heater efficiency, through better heat dispersion. The lowering of the water surface temperature can help reduce evaporation. Installation is simple. Just unscrew the return-jet fittings and replace them with the Circulator. Special adaptors are provided, for above ground pools such as: Intex or Easy-Set, Bestway or Coleman, Summer Escape, Summer Wave or Pro-Series, Doughboy and Lombert above ground pools. All existing return jets must be replaced, with The Pool Circulator, to achieve optimum results. Better circulation helps eliminate the dead zones, that promote cloudy water and algae growth. Without proper circulation, water forms layers, based on temperature differences. This promotes poor and inadequate, distribution of chemicals and heat. The Pool Circulator should be installed, in each return jet, for optimum performance. Once installed, water flows spiraling in every direction, improving the chemical dispersion, eliminating dead zones and improving heating, filtration and water quality. Now includes a FREE Economizer Flow Control Hood, $12.95 Value, which eliminates splash-out and helps send more chemicals and heat to the pool floor, while directing more surface debris towards the skimmers. Just set the angle to best suit your pool's needs. The Pool Circulator can help you get achieve results, while reducing filter cycle times. The Circulator disburses chemicals more effectively, throughout the entire pool, improving pool water quality. The spiraling circulating action helps to better disperse chemicals, so that they perform at their expected potential. The Pool Circulator sends spiraling flows of water, forward in all directions. Slower rotation results in more force pushing the water spiraling ahead. You'll get the benefits of better water quality and saving on chemicals and energy usage. Put an end to dead zones, that promote algae growth. You achieve and maintain more consistent water quality, by replacing all of the return fittings with The Pool Circulator. 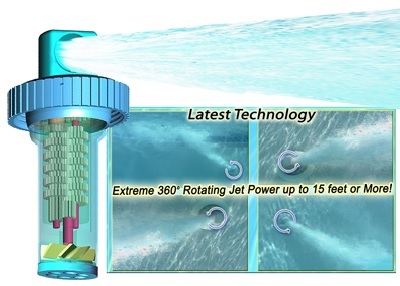 ● The patented Pool Circulator is a design marvel, that provides as much as 1500% more circulating power. This will save you time and money, by reducing the length of filter cycles! 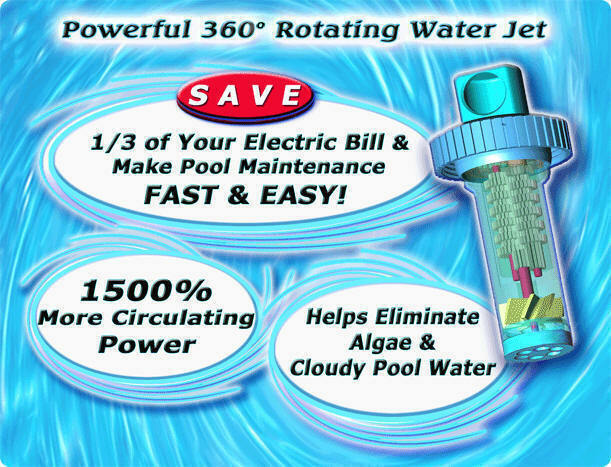 ● Helps eliminate cloudy pool water, by eliminating dead zones, that cause algae blooms. ● Cleaning becomes virtually effortless, with the spiraling return water jets shooting down the walls of your pool, making your pool vacuum and filter much more effective. ● Helps remove silt from the pool floor. ● Safe to use in pools with salt chlorine generators and all other types of chemical sanitizers or sanitizing equipment. ● Installation is as simple as it gets! ● Adaptors are available, for use with pools outside of North America. ● Use in any type of pool, equipped with screw in return-jet fittings. ● Special Adaptors are provided, for use with most popular above ground pools - See Below. ● Simply remove the existing "eyeball" fitting and screw in The Circulator. ● The Pool Circulator extends into the return pipe about 3 inches with only about 1-inch extended from the pool wall. ● NEW!!! FREE Economizer Flow Control Hood avoids splash out, if any return jet is located too close to the pool water surface. This versatile accessory, $12.95 Value, attaches to The Pool Circulator, in any pool. It provides better control and results, by sending more water to where it is most needed. ● Direct the flow in any direction: up, down, sideways or recirculate. ● The Pool Circulator will pay for itself and provide savings in electricity, heating, and maintenance. ● Limited lifetime factory warranty. The Pool Circulator is compact and should fit virtually all pools world-wide, provided they are equipped with wall-mounted pool return fittings. Most North American inground pools do not any require adaptors. A special model, with an adaptor accommodates Intex or Easy-Set pools. Custom adaptors are also available for Bestway, Coleman, Doughboy, Lombert, Pro-Series, Summer Escape and Summer Wave pools. A Pool Circulator must be installed, in every return outlet, for proper performance. Installation consists of unscrewing the old fitting and replacing, with the Circulator. Occasionally, installation requires an adaptor, because of the use of non-standard return fittings. Have no fear! If you encounter any sort of installation problem, we will provide any required adaptors, at a small, nominal, shipping and handling charge. E-Mail us at askalanaquestion@msn.com and provide a telephone number and any other helpful information. A product expert to get back to you, with a solution. Click here to read some Circulator feedback letters. The Pool Circulator can be used with single return jet Intex and Easy-Set pools, but a special 2-part adaptor is required. It is included in the purchase price. 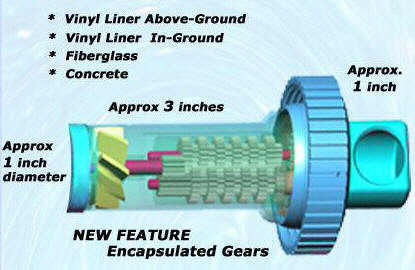 The installation is still simple and it will improve circulation, filtration, as well as chemical and heat distribution. Suitable for use world-wide. NEW! The included addition, of a FREE Economizer Flow Control Hood, $12.95 Value, helps avoid splash out and sends more water, chemicals and heat. to the pool floor, as well as directing floating surface debris towards the skimmer. Scroll down to order this model. The Pool Circulator can be used with single return jet Bestway, Coleman, Doughboy, Lombert, Pro-Series, Summer Escape or Summer wave Pool, but a special adaptor is required. It is included in the purchase price. The installation is still simple and it will improve circulation, filtration, as well as chemical and heat distribution. Suitable for use world-wide. NEW! The included addition, of a FREE Economizer Flow Control Hood, $12.95 Value, helps avoid splash out and sends more water, chemicals and heat. to the pool floor, as well as directing floating surface debris towards the skimmer. Scroll down to order this model. BONUS!!! Free with a current purchase of The Pool Circulator. The Solar Light has a suggested Retail Value of $39.95. LIMIT OF ONE PER CUSTOMER ORDER. QUANTITIES ARE LIMITED. ACT NOW!!! For Intex, Easy-Set, Bestway, Coleman, Doughboy, Lombert, Pro-Series, Summer Escape or Summer Wave Above Ground Pools, make the right selection, below, to get the proper adaptor. * Many higher quality above ground pools are made with the same return jet fittings as inground pools. If unsure about your above ground pool, see below. See directly below, if you have an Intex or Easy-Set pool. Price includes a Special 2-part adaptor, for use with Intex or Easy-Set pools. See directly below, if you have a Coleman or Bestway pool. 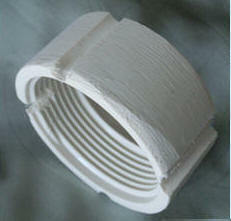 Price includes a Special Custom Adaptor, for Bestway or Coleman pools. See directly below, if you have a Summer Escape, Summer Wave or Pro-Series pool. Price includes a Special Custom Adaptor, for Summer Escape, Summer Wave or Pro-Series pools. See directly below, if you have a Doughboy pool. Price includes a Special Custom Adaptor, for Doughboy pools. See directly below, if you have a Lombert pool. Price includes a Special Custom Adaptor, for Lombert pools. For Intex, Easy-Set, Bestway, Coleman, Doughboy, Lombert, Pro-Series, Summer Escape or Summer Wave Above Ground Pools, make the right selection, from the above choices, to get the proper adaptor. Not Sure? Email us a pool and a return jet image, if possible. One cent of the shipping and handling cost will be billed as the cost of the item. Offer valid only with a current order, for The Pool Circulator. Limit of 1 per customer order. One cent will be billed as the cost of the item, as the system requires a price greater than zero. The Fountain and/or the Solar Light must be ordered, at the same time as The Pool Circulator, to qualify for this special offer. Otherwise, additional shipping charges may apply. Some older inground pools may require an adaptor. Use the link below, to select the one you need or send us an email, with a telephone number and a product expert will contact you. Removes sediments from source water. Washable & Reusable.